Can the Browns Finally Challenge the Ravens & AFC North? ≈ Comments Off on Can the Browns Finally Challenge the Ravens & AFC North? Right now, quarterback Brian Hoyer has a record of 4-1 as a starter, dating back to last season. Let me be clear: a quarterback, on the Browns, has won 80% of his games! Can you recall the Browns doing anything like that in your lifetime? Not only did he win last week, he beat a high flying Saints team that wanted to make a statement after losing to their hated rivals, the Atlanta Falcons. He did this without his top wide receiver (Josh Gordon), his top tight end (Jordan Cameron), and his starting running back (Ben Tate). All the while he has a college legend nipping at his heels to takeover the job, and was widely applauded in his brief appearances on Sunday. Red arrow direction indicates a win over a team. Interesting, right? The question, however, is this: could the whole AFC North be better than the Falcons & Saints, two teams expected to contend in the playoffs? Sure, the Browns did have to come back to beat the Saints while the Falcons had an easier time. Speaking of easier times, did you catch any of that beat down on Thursday? I couldn’t believe my eyes when I saw that Tampa Bay could play that badly. Although, that defense has really come together and shut down one of the top 3 QBs in the league with relative ease. Refer to the flow chart. Just because the Browns held their own for a while against the Steelers and pulled through at the end vs the Saints, doesn’t necessarily mean they can hang around with the Ravens. Omit that disastrous first half versus the Bengals, and you begin to see a potent Ravens team on both offense & defense. You can judge the team better by how they’ve done the past 6 quarters than how they were in the first 2. Before you look at the statistics, can you guess where the Ravens are ranked on offense? Surprising, eh? And that’s combined with the terrible first half performance against the Bengals where they only gained 97 yards! Looks like our guys have gotten a good balance going, and early in the season too. This may bode well as we go on through the 16+ game slate. Then again, maybe the season seems “off” because the first two weeks haven’t been what the sports analysts expected. For starters, the Bills & Texans are 2-0 while the Colts & Saints are 0-2. Also, the Panthers have gotten off to a 2-0 start despite being picked by many as the most likely playoff team to regress. The Buccaneers were one of those teams that were picked to improve, and have instead looked like the worst team in the league with their current 0-3 record. Then, you have Peyton Manning & Tom Brady not showing the kind of high scoring, stats obliterating, dominant game playing that they have for years. Brady has less than 400 yards passing through two games along with a completion percentage at 55%. Manning has dropped off from his record breaking level last year (which was to be expected) and has a very low number of passing attempts compared to his previous years and other quarterbacks. Neither have been worth their weight in fantasy football leagues, so that may affect their perception. But, you know what? These odd growing pains early in the season happen just about every year. Philly is leading the NFC East with a 2-0 record, but look at how they’ve won. Both times, they were down by at least 14 points heading into the 2nd half and wounded up winning. They started off very slow and finished strong once they got comfortable. Even the Jaguars (!) were leading the Eagles 17-0, and that’s the same team who was just flattened by the RG3-less Redskins 41-10. I guess you can call this “early season jitters.” The strong teams will show themselves soon enough and we’ll have a better idea of which teams are elite by at least… week 10? Just remember, a team may be 2-0 now, but the worst team in the league last year was also, and finished 2-14. (Speaking of which, the 2014 Texans have the same record at this point of the season as last year. Then again, they were also 2-0 in 2012.) And 0-2 isn’t the end of the world for teams. When you get to 0-4, then that’s when it’s time to start thinking of next year. The Ravens don’t have to worry about starting 1-1 either, as they have no pressure to stay undefeated or get their first victory. Both teams do need this win this Sunday. The reason being that the loser will have already lost two divisional games. The divisional record is the second most important criteria for determining division winners, after the regular season record. 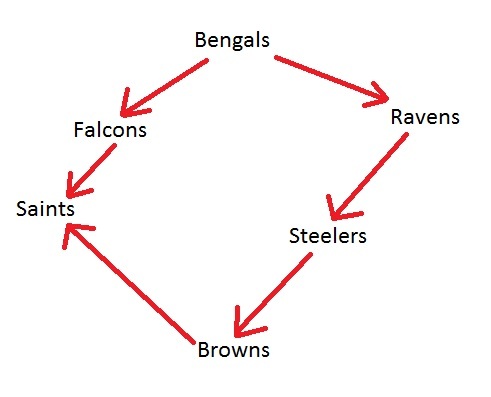 Let’s say the Ravens & Bengals split their series and finish the season with identical records. Let’s also say they both split their series games versus the Steelers. Now, the best way to take the division would be to have more wins over the Browns. Over the last two years, the Ravens have beaten the Browns 3 games to 1 loss, while the Bengals have split the series in both years (a common denominator last season was that the Browns beat the Ravens & Bengals with none other than Brian Hoyer at the helm). All that means is that the Ravens have been able to pad their divisional record with visits against the Browns while the Bengals couldn’t count on an easy victory from Cleveland. Also, the first time since 2007 that the Ravens didn’t sweep Cleveland happened to be the first time since 2007 that they missed the playoffs. The Browns, meanwhile, last had a winning record in 2007, and that was the last time that they swept the Ravens. This correlation between the two teams’ success should be noted going into this game. For this Sunday (1pm on CBS), the Ravens should be getting Ladarius Webb back into the lineup to better the secondary and not allow long passes like the big A.J. Green catch for the Bengals. The Browns, meanwhile, might have Jordan Cameron healthy enough to get some playing time. This would be great for Hoyer, seeing that it’s his best receiving option bar none. For once, I’m actually worried about the Ravens’ chances against the Browns, but they should find a way to pull through. Now that they’ve had some film study on Hoyer & have learned from last year not to take him lightly, we should see some exotic packages against Hoyer. I wouldn’t be surprised to see the Ravens find a weak point in the Browns OL and send blitz after blitz on that one side until the Browns adjust, likely with a running back or tight end to block. Maybe we’ll see 200 yards rushing by Forsett, Pierce, & Taliaferro and thereby preventing Hoyer from having time to do anything. I’m predicting a 20-6 win for the Ravens, but it’ll probably be much closer. Enjoy the weekend and go Ravens! P.S. As you’re aware, the Orioles have clinched the AL East. If they win 8 of their final 10 games, they will get to 100 wins! At this point, it looks very possible.